About Ask Leo! and Leo Notenboom … and Making Technology Work - Ask Leo! I help people use technology more effectively, giving them the confidence to do more, be more, and explore more of the world that today's technology makes available to us all. I believe personal technology is key to humanity’s future. It has an amazing potential to empower individuals. But it can also frustrate and intimidate. Each week I publish The Ask Leo! Newsletter where you can find more answers tips and tricks to make your technology “just work”! I want to make technology work for you. 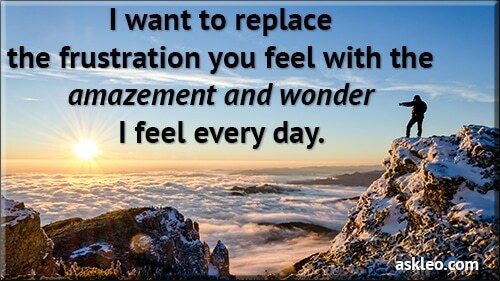 with the amazement and wonder that I feel every day. a valuable tool instead of a source of irritation. I want personal technology to empower you so you can be a part of that amazing future. I just want it to work, for you. I write books, I answer questions, and I educate on important technology topics and trends. And I just generally share my passion and excitement for the possibilities I believe personal technology holds. That means you’ll find one of the most important and hard to come by things on the internet: answers, written in a way that you can understand. I may not have every answer, but I do try to make sure that I take on the important stuff – the questions that people are asking most often and the most important things you can be doing right now to keep your computer – and yourself – empowered and safe. The important stuff that take you from fear and frustration to “It just works”. I want to make technology work for everyone. Because I love this stuff. I’m one of those weird people that plays with computers because I really, really enjoy it. It’s both my career and my hobby. I’ve been in the personal computer and software industry since 1979, as a software engineer, a manager of software engineers, as a consultant and as a writer. In 1983 I joined what was then a medium sized local company called Microsoft and spent the next 18 years in a wide variety of groups working on a wide variety of software. If you’re running Microsoft Windows, if you’ve used a Microsoft development tool or Microsoft Money, or if you’ve ever purchased a ticket through Expedia, there’s a good chance you’ve been touched by some of my work. And of course, since 2003, I’ve been helping to make technology work here on Ask Leo! If you want to see what else I’m up to, check out my online business card, which lists many of my other current roles. Join me (and thousands of others)! Sign up for The Ask Leo! Newsletter using the form above and once you confirm you’ll join thousands of other readers who’re getting information in their inbox every week to help them make the darned thing “just work”. Let’s make technology work for you too. What’s the Technology Behind Ask Leo!? - Over the years the technology on which Ask Leo! is based has changed a little. I'll give you an overview of the current state of affairs. Does technology isolate or connect? - There are those who feel that technology is isolating us from the world. I couldn't disagree more.